Born July 21, 1927 McLean, SK., died May 3, 2018 Edmonton, AB of natural causes. Florence Mish was so small when she was born she slept in a shoe box. While she remained small in stature throughout her life, her persona was loomed large. Florence and her siblings were raised in Wolseley, SK. Their father was injured in his prime and her mother Mary, a Polish immigrant was left to support a family of 7 with no assistance. Florence’s childhood was shaped by the responsibilities of pulling weeds, washing clothes, tending animals, cooking supper and a fair amount of ‘make your own fun’. With her brother Ed, they got up to all manner of rascal-type activity during their early years. They would remove a lightbulb from its socket in their bedroom and see who could stick their finger up highest without getting a shock. Florence regaled us all with stories of their childhoods. 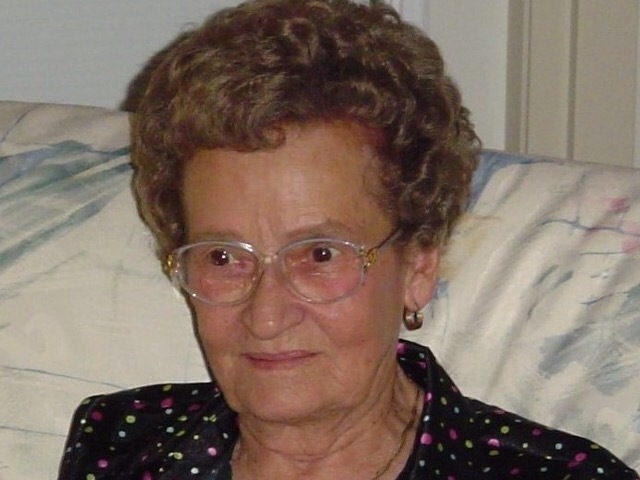 Florence worked for the International Union of Operating Engineers Local 955 in Edmonton for over 20 years and once retired she volunteered for the West Division of Edmonton Police Service. She was never a timid person and always spoke her mind. Florence wouldn’t shy away from asking the awkward social or personal questions many of us think of but never voice. And when she asked one of those questions of others, we might squirm slightly but then we’d lean in to hear the response. You knew though, if she asked those questions of you, you were sunk. Florence was a great family connector, keeping in touch far and wide. Florence remembered birthdays and anniversaries and whenever she could she’d travel to join in the gathering. She liked a party and was everyone’s favorite aunt. In her memory we will strive to carry some of her spirit, vitality, directness and love of a good time in all of us. Tomorrow I am going to meet with friends to talk about blogging. It is not easy to keep writing blogs over time. Some of it might be the knowledge that if you slow down and then stop blogging you may find out no one really cares. I recall a segment in one of Garrison Keillor’s CD’s (it was a tape when I first heard it), The Young Lutheran’s Guide to the Orchestra. He talks about hosting a university radio program on classical music. He took it on mostly to impress a girl he admired but had never spoken to. He screwed up his courage and asked her, one day, if she listened to the program and she said “All the time”. The next day the sound engineer told him there had been a transmitter problem and the show had basically not gone out over the waves for several months. And no listener had called in to ask why. In other words, no one missed him. Blogging, is sort of like that. It might be fun while you do it but when you quit, well, unless you’ve got a special talent or topic or you’re a celebrity, no one misses you. That said, I am happy to share the little I know about blogging with others who plan to use the platform for good things. Their interest has piqued mine. I went so far as to change the picture from a winter scene (it hasn’t been winter for months) to one that looks like Gros Morne Park in Newfoundland at this time of year. Since I haven’t blogged for so long I need to refresh my memory of how to do things and so will end with a totally unrelated (to the topic above) series of photos. We were on a road trip to Eastern Canada earlier this month. We logged 5700 km in two weeks traveling and sightseeing in New Brunswick, Prince Edward Island and Nova Scotia. Not long into the trip I started to take pictures of the salt and pepper shakers. Don’t ask me why. I wish I’d thought of it one day earlier as I missed the little white Eiffel Tower set in Edmundston, NB. And so, to the seasonings of the Maritime provinces. And if there is anyone out there reading this, let me know. Before we go away I do all manner of things unrelated to preparing to go away. It seems I want to run myself short of packing time…and I usually do. I do it every time we go away and cannot seem to help myself. Any suggestions to break this very inefficient behaviour? While getting ready to go I think of all the things I’d do if I stayed home. I would clean and purge those basement shelves that have set there un-purged for a long time. I would organize that stationery drawer and the linen closet if I stayed home. If you order a salad in a restaurant and two bites in you discover a long hair is part of the repast, two things happen. First your appetite diminishes substantially and second your meal becomes more economical as the manager “comps” it. I’d prefer really to just pay for it and not find the hair. Audiobooks are a very good way to pass time in the car. Providing the subject is of interest to everyone in the car. When arriving in new city on a happening Friday, don’t wait till 7pm to try to find a place to eat. It is the time when everyone else is looking to do the same thing. Driving around from place to place doesn’t work. Do you have gems of travel wisdom to share with someone (me) who obviously could use them? I read but don’t buy books generally speaking. The Ottawa Public Library is my main go to place for books. Thankfully there is no limit to the number of times you can borrow a book but after a while guilt has kicked in with this book and I will not borrow it again. Would someone please read “Poor Economics”and give me a report. This all started when we were given a gift certificate to KIVA a micro-loan organization. From their website “Kiva Microfunds is a 501 non-profit organization that allows people to lend money via the Internet to low-income / underserved entrepreneurs and students in 82 countries. Kiva’s mission is “to connect people through lending to alleviate poverty.””. You are able to read the profiles those who are requesting loans and you pledge your donation to that loan. Once repaid you receive an email and are able to re-loan to another entrepreneur/student. This sounds very good, the concept of micro-loans and it led to me to read reviews about KIVA, where most but not all are positive. I started pulling on the thread. The question for me was if you have the means and the will to donate to help those in need, what’s the best use of your donation? Do you rely on the Moneysense review of charities? Their report ends by saying the information they have gathered shouldn’t be the only thing you use in deciding where to donate. Do you poor through publicly available information on each charity? Mind boggling. Somewhere in my research the book Poor Economics was recommended. I have tried to read it. Many times I have tried to read it but I find it a tough slog and the library loan period runs out and I take it back only to re-borrow it later. One of the comments on the book cover is “A marvellously insightful book by two outstanding researchers on the real nature of poverty”. And well it may be but for me the insights are buried within the text. Highlights of key points in chapters would help me. Formatting that makes the book look more approachable would help me. What does the book say? I made it halfway through the book finally. There are some very interesting findings. Now that I’m returning to the library AGAIN I flipped to the back of the book to see if there’s a summary. They say there are five key lessons, First “The poor lack critical pieces of information and believe things that are not true.” Second “The poor bear responsibility for too many aspects of their lives. The richer you are, the move the “right decisions are made for you”. There are three more lessons but if I quoted them here then why would you read the book? When it comes to donating I think I’ll go with an excerpt of Abraham Lincoln’s quote “When I do good, I feel good.” I’ll do some research into organizations but not get into a knot about the whole thing. How do you go about deciding where to donate? A Short History of Progress wass written by Ronald Wright in 2004. The book comprises the 2004 Massey Lectures. You can listen to the series on-line as well. While the the book was published over a decade ago, the messages within could have published this morning for they apply, perhaps even more so, today. The lessons Wright draws from history are very relevant as the Paris climate summit begins this week. The book isn’t about climate change per se. The author is a “historical philosopher” shows how our modern predicaments are as old as civilizations. He traces our species from our beginnings to the present. We read about the successes and failures of civilizations throughout our history. He asks and analyzes why many (most?) civilizations in the past became extinct and he draws a picture of where we are today and the need to pay heed to the past in our actions today and in the future. One phrase he uses more than once is “every time history repeats itself, the price goes up”. As you read you wonder why mankind continues to act in certain ways, much of which would make you want to belong to kinder species. In asking why we continue to do some things, Wright uses computers as an analogy. He says if man were a computer then we would be hardware running on software that hasn’t had an upgrade in 25,000 years. Wright notes if you don’t believe that, just listen to the news. It’s not possible to make light of Wright’s take on things. For the ordinary citizen we can urge leaders to make a difference (as we hope the world leaders in Paris will do this week) and we can take action in ways to make the world a better place. To use the analogy that mankind is akin to computer technology. I would hope that despite mankind’s ancient hardware we can find a workaround that keeps us from repeating history and helps sustain our future. What are your thoughts? Protest sign using recycled Green Party sign. Seems apt.